what a fabulous idea - Just wanted to compliment you on a wonderful idea brilliantly executed. …with young childrenA big question parents are asking themselves across the land is how can they keep their living zone tidy and retain the style they’ve taken so long to achieve with little ones leaving a trail of sticky fingerprints and plastic toys in their wake?Great storage is, without doubt, the key. If space and budget permit, it’s well worth commissioning some built-in units to really make the most of your space. Huge, floor-to-ceiling cupboards in easy-to-clean, hard-wearing materials are a good option. 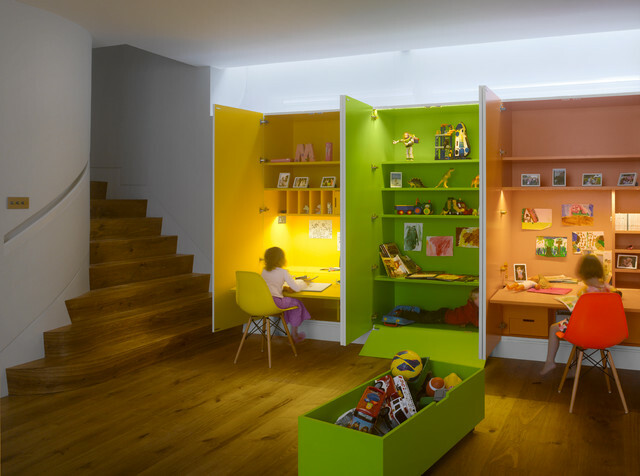 They open up to reveal masses of storage opportunities for toys and crafts, and you might even be able to incorporate a little desk space for homework, as with these designs. For an added touch, each interior can be painted in a different hue for a little fun while they’re open. And when the day is done, any toys and mess can be closed away.If this isn’t an option, try a large, freestanding cube storage system fitted with pull-out baskets and drawers, with a designated place for every last felt-tip pen.